Long time, no see, everyone! For those of you following me on Facebook, you know I haven’t been inactive as I finished the NFL regular season with another successful 63% prediction rate. Now, as Sports Thoughts begins its third year online, it’s time for some playoff predictions. With an exciting week ahead of us in a wide open field of playoff contenders, let’s take a look at who will move on to the Divisional Round. We start in Houston with an AFC South clash. 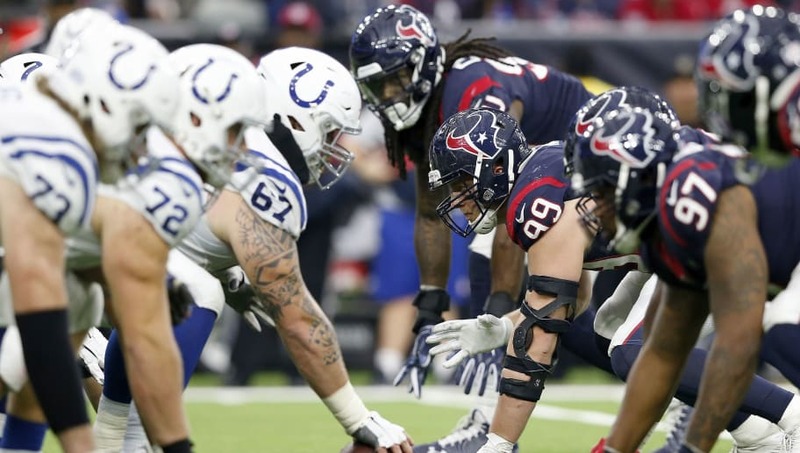 As the Indianapolis Colts and the Houston Texans both claimed a three-point road victory against each other already this season, these teams could hardly be more evenly-matched. As the two prepare for their third meeting, the difference in the game will come from coach’s strategies and in-game adjustments to the familiar foe. The Texans are far from the hottest team in the League right now, scuffling into the postseason winning only two games last month, and squandering a chance at a first round bye. However, for a team that started 2018 with an 0-3 record, I think Houston fans can still be delighted to finish with the third-best record in the AFC. Riding a midseason nine-game win streak, the Texans’ electric offense led by the Clemson combination of Deshaun Watson and Deandre Hopkins spreads opponents with their pace and explosiveness. The defense isn’t bad either, with a front four that has J.J. Watt and Jadeveon Clowney pressuring the quarterback. A team with talent all over the field, the Texans certainly seem to be flying under the radar as a dangerous contender. The Colts have scratched and clawed their way to their first playoff berth since 2014. After a 1-5 start, the Colts went on a tear to win nine of their last 10 games to earn the sixth seed, the only loss being an odd 0-6 score in Jacksonville. Indianapolis needed every win too, as a loss to the Titans in Week 17 would’ve ended their season. The constant must-win scenario took a toll on the Colts’ health, as T.Y. Hilton and Marlon Mack in particular have played through injuries nearly every week. As the pressure mounts and lack of recovery time continues to add up, it remains to be seen just how long these star players can hang on. Defensively, Indianapolis has been admirable, led by Rookie of the Year candidate Darius Leonard. So, while the Colts are smoldering hot right now, do they have the health, stamina, and balance to escape Houston with another win? When it comes to match-ups that feature so much familiarity, the result goes beyond the Colts’ hot streak and the Texans’ slightly superior talent. Houston coach Bill O’Brien and first-year coach Frank Reich go toe-to-toe in decision-making during crucial times of the game. Who goes for it on fourth and one? Who kicks the field goal on fourth and goal? While O’Brien has the edge in experience as a head coach, Reich just won a Super Bowl with the Eagles and certainly has an idea of what it takes to get back. I look forward to watch this chess match kick off this afternoon. The night cap features two fan favorites. The Cowboys are back in the playoffs after being quickly eliminated in their last appearance in 2016, despite having the best record in the NFC that year by far. Some blame the decision to rest their star players in a meaningless Week 17 game before a first round bye as one reason for their upset to the Packers. So, this year, in another meaningless game, the Cowboys played nearly everyone in the last game against the Giants. This allowed both Ezekiel Elliott to rest, and star linebacker Leighton Vander Esch to get hurt. Whether these roster moves come from coach Jason Garrett or owner Jerry Jones, I believe Dallas needs to take a very close look at what successful teams’ strategies are as the playoffs near. The Seahawks, who many thought were heading toward a rebuild after an 0-2 start, have made it into the playoffs. Despite a defense that is a shell of the “Legion of Boom” that made it to the Super Bowl a few years prior, linebacker Bobby Wagner has left his mark and helped the Seahawks cruise to a five-seed, only missing out on the division title because they had to deal with the Los Angeles Rams. 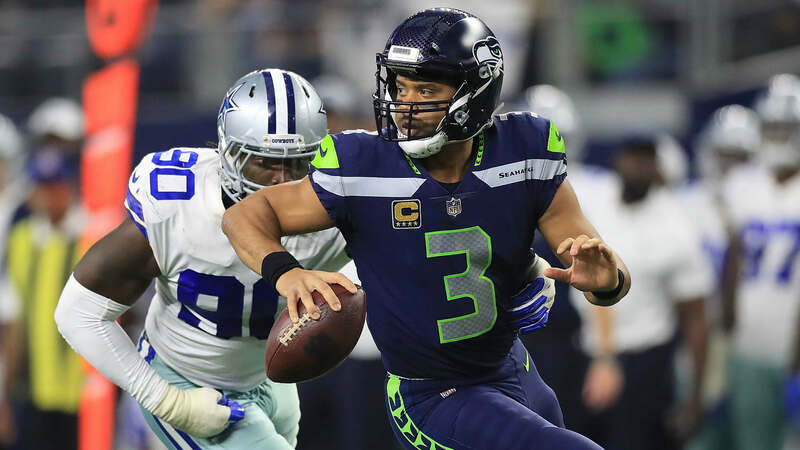 On offense, Russell Wilson continued to get better as the season went on, piling up yards through the air and on the ground against good teams like the Chiefs and the Vikings down the stretch. Chris Carson balances the attack with a powerful run game and a relentless motor. Similar to the Texans, the Seahawks go to Texas balanced, healthy, and hungry. The hometown Cowboys are favored in this game, but you wouldn’t know it if you watched their last few games. Dallas’ once-scary offense of Dak Prescott, Elliott, and one of the best offensive lines of all time has plummeted. Whether it’s Garrett’s tired play-calling or injuries to the big men, the offense has noticeably scuffled to just 21 points per game. In other terms, the Cowboys went from the third-best offense in the NFC in 2016, to the fourth-worst in 2018. In addition, they enter this game following a 23-0 drubbing by the Colts, and two narrow victories to teams with top-6 draft picks. Meanwhile, as I mentioned, the Seahawks are playing some of their best football down the stretch. Though they got upset by their arch-rival 49ers in Week 15, they still won six of their last seven games including prime victories against the aforementioned Chiefs and Vikings, as well as the Packers and the Panthers. 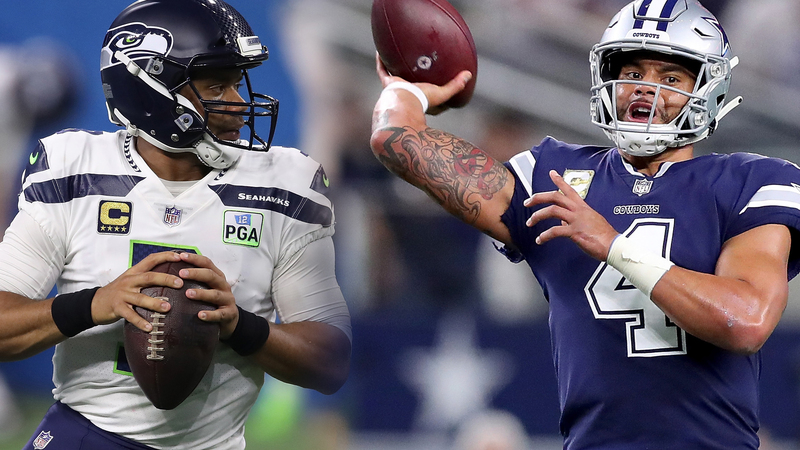 Though Seattle doesn’t dominate anybody, their ability to win away from their infamous home crowd against big time opponents is crucial in the postseason, and their hot streak will ultimately lead them to the Divisional Round. Following the trend, the Ravens steamrolled through the back-half of their schedule, winning six of their last seven games to narrowly top the Steelers as AFC North champions. Ever since Lamar Jackson took over as quarterback (who, by the way, I still think is the best QB of his class), the Ravens have been nearly unstoppable, falling only at a raucous Arrowhead Stadium by a field goal. Now, their staple of a physical defense with a new dual threat quarterback gives Baltimore a unique dangerous look as a popular dark horse for the Super Bowl. I really like the Chargers this year. They were my pick to win the AFC West this year, and as it turns out, they were a tiebreaker away (or a win over the Ravens in Week 16 away) from not only taking the division, but the entire conference. Instead, they take to the road at 12-4 to travel across the country and face a really motivated Ravens team. Led by Philip Rivers, perhaps the best QB without a Super Bowl appearance, the offense can hurt opponents in a number of ways. With a healthy Melvin Gordon in the backfield and a speedy Keenan Allen out wide, the stout Ravens defense will have their hands full. However, the matchup to watch is on the other side of the ball. Lamar Jackson is undoubtedly inclined to use his legs more than his strong arm, and the Chargers have one of the best defensive lines in the League. Joey Bosa will certainly get his shots at the quarterback, but it’s up to the rest of the front to contain him. If Coach Anthony Lynn over-pursues his blitz, Jackson will have a field day. If he mixes up coverages at the line for the young QB, the Chargers have the ability to shutout an inexperienced offense. As the Ravens don’t have a bunch of playmakers, it’s easy enough to dedicate a man or two to the spy position as a failsafe which should always keep the L.A. defense in third down positions. Of the fourteen years Philip Rivers has been in the NFL, this has got to be his best team to date. He has good chemistry with the first-year head coach, and plenty of weapons surrounding him. The Ravens defense is as good as they come, but his veteran leadership and decision-making will be vital to get points on the board. This one is going to be fun for neutral fans, as it promises to be low-scoring with plenty of momentum swings throughout. The final wild card game features the reigning World Champions and the Cinderella story Chicago Bears. Last year, Philadelphia won the Super Bowl after their star quarterback Carson Wentz went down in Week 14, leaving Nick Foles to start in Week 15 and beyond. Eerily, the same scenario unfolded for Foles and the Eagles this year. Will history repeat itself? I don’t like betting on defending champs often, because usually the drive to go back-to-back isn’t there. However, with their backs against the wall after a brutal defeat to the Cowboys late in the season, the Eagles won their final three games to clinch the last playoff spot. In addition, the underdog role isn’t new to Philly, as they weren’t favored in any of their playoff victories last year. With so many similarities to last season, think twice before ruling out the Eagles again. Speaking of last year, the Bears were 5-11 and dead last in the NFC North a year ago. Now, with first-year head coach Matt Nagy and the addition of Khalil Mack, the Bears have made a complete turn around to Division Champions. The offense is okay under young quarterback Mitch Trubisky and the running back duo of Tarik Cohen and Jordan Howard, but the real star is the defense. As much of a problem as Mack is for the backfield, Eddie Jackson and Kyle Fuller boast an impressive secondary. If “defense wins championships”, the Bears have little to worry about as they try for their second Super Bowl in history. 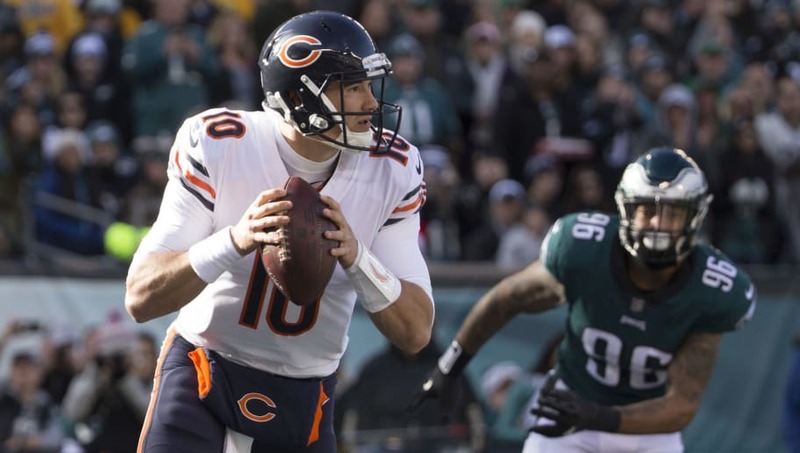 The Eagles have their work cut out for them in Soldier Field, but they have invaluable playoff experience that the Bears don’t have. Advancing in a win-or-go-home format is unlike anything in the regular season, and the Bears could find that out the hard way. However, the Bears have a feisty defense, and they are relentless to the ball which often frustrates offenses and takes them out of rhythm. If the Bears and their fans can break up the Eagles’ playbook early, they can cruise, even if they can’t put up a lot of points on offense. It’s been a whirlwind of a day, so I’m going to make this one pretty brief. I talked more in-depth about the Red Sox and the Dodgers in my 2018 NLCS/ALCS Predictions that accurately selected the two powerhouses to advance this far. So who will hold the Commissioner’s Trophy? Let’s take a look at the World Series. Long story short, both of these clubs easily have the most stacked lineups from top to bottom in the MLB. The pitching rotations aren’t great, but they are built to win playoff games with 2 or 3 aces. Both bullpens have been shaky at times, but dependable which is all one could ask for in October. However, there are two key differences. The first is the managers. Dave Roberts is a seasoned veteran. He’s been criticized at times, but at the end of the day, he knows his players very well and puts together a strategic lineup every game. His in-game use of the bullpen and various double switches could be improved, but I give him a solid B+. Best of all, Roberts was managing games this late last year too, as his team fell to the Houston Astros in the Fall Classic. The man knows what it takes to win in the playoffs, and what he did to lose in them. That’s not to say that Red Sox manager Alex Cora is inexperienced. It may be his first year as the skipper, but he too was in last year’s World Series… helping AJ Hinch’s team take the title. As a rookie manager, Cora has led Boston to their best regular season in franchise history, and is now just four wins away from the cherry on top. If he trusts himself as much as his team and fanbase does, the Red Sox will not be at a disadvantage in coaching. The second difference is consistency. The reason the Dodgers couldn’t knock off the Brewers sooner is their inability to always score. The Brewers did a great job of putting points on the board every night. No, they never scored 8 or 9, but 2 or 3 is sometimes all it takes in the playoffs. Sure, the Dodgers are capable of it, but they are equally likely to be shut out too. The Red Sox aren’t perfect in that sense, but much more reliable. Boston cans struggle at the hands of good starting pitching, as most teams do, but what sets them apart from the League is their drive to dig and string a few hits together when it matters. They rarely get blown out with their never-say-die mentality that ultimately stems from a player’s coach and that MVP in right field. And then there were four. In last week’s action, I got burned for sticking with my April pick to win the World Series, but I can’t be upset with correctly picking the other three finalists, predicting the first six games winners, and even getting the winning score correct in the first four of those games. I’ll try to keep it rolling. Let’s take a look at who’s moving on to the Fall Classic. Things kick off tonight with the Dodgers visiting the Brewers. Both teams cruised through their respective division series with the Brew Crew shutting down the Rockies’ offense, and doing their job to advance, while the Dodgers were one grand slam away from doing the same to the Braves in three games instead of four. I mentioned before why I love this year’s Brewers team. They actually remind me of the 2003 World Series Champion Marlins. There is just nothing special about them. No superstars, no perfect pitching, not the best coach in the world, but everyone does his job. They consistently manufacture three or four runs a game, and the pitchers can grind out quality starts without giving up the big inning. The Brewers are a team that doesn’t beat themselves, and when the opposition tries to do too much, Milwaukee’s small ball prevails. They are riding an 11-game winning streak, one shy of the franchise record, as they look to march on and claim their club’s first ever Commissioner’s Trophy. With everyone else having won a championship before, one could argue that the Brewers want to advance more than any of the remaining teams. The problem is, I don’t see a glaring weakness in Los Angeles. They do have superstars, great pitching, and one of the best coaches in the League. Justin Turner, Max Muncy, and newly acquired Manny Machado lead the way, but I truly believe every hitter in that dugout is dangerous in the right spot. They have a good balance of power and contact that can break down most pitchers and be successful over 9 innings. The pitching staff is obviously headlined by Clayton Kershaw, who is still looking for his first ring. Arguably the greatest pitcher of all time, Kershaw needs to put his postseason struggles behind him to solidify his legacy. Next in line is rookie Walker Buehler, who was shelled by Ronald Acuna, and Rich Hill, who has been in the NLCS a time or two. That’s the key for L.A.- experience. The Brewers haven’t seen a spotlight like this in a long time, and the Dodgers were here last year. Manager Dave Roberts has done a fantastic job managing his players through injury and hot streaks, and this series should be no different. He knows his team well, and the outcome of this series is on his shoulders. Easily the two best teams in the American League this year, it’s only fitting that these two titans would clash with a trip to the World Series on the line. The clubs meet for the second October in a row, as the Astros took down the Sox in four games in last year’s ALDS en route to their first World Series in franchise history. Now the question is, do they have the hunger to do what no team has done since the ’98-’00 Yankees and go back-to-back? The Red Sox boast a dangerous lineup of studs. Mookie Betts leads the way in my AL MVP voting in part due to his deadly combination of power, contact, and speed in the field. J.D. Martinez is a straight slugger with no fear, and it looks like even utility guys can come off the bench and hit for the fist cycle in MLB postseason history like Brock Holt. As good as Houston’s pitching staff is, they have their work cut out for them. The ALCS most likely depends on the play of Boston’s starting pitching. The bats are there and so is the bullpen, but the starters all have a record of being shaky in the playoffs. Sure, the Yankees can make anyone look bad on any given night, but it’s been a trend for too long from guys like Chris Sale and David Price. It will be interesting to see what first-year manager Alex Cora does if these guys start to struggle early versus late. I’ll bet he wants to beat the Astros more than anyone else, as he was a part of that team that won it all last year. Minus Cora, the Astros bring back virtually the same team, and in virtually the same form from 2017. If anything, they got better with the addition of former Pittsburgh Pirates ace Gerrit Cole. The pitching staff was lights out against the Indians, taking care of business in a quick three-game series. The Indians’ lineup isn’t mild by any stretch, but the Red Sox are on the next level. Cole along with my Cy Young pick Justin Verlander will have to prove that they are among the best throwers in the MLB if they want to get back to the Fall Classic. Another great thing about Houston is their patience at the plate. Jose Altuve, George Springer, and Alex Bregman could not be more composed in any given situation. With their leadership and experience, the pressure is on Boston to force a swing-and-miss. As long as the rest of the lineup follows suit, I don’t see the Red Sox doing that four times a game. Then, it’s all about a shootout. These teams are so evenly matched, it’s anybodies guess what happens game-to-game. On to the next one. After one anticlimactic victory in the Bronx and an absolute heartbreak at Wrigley, we have narrowed the field to eight. I do feel for Chicago. One day they’re one big hit away from the best record in the National League, and 24 hours later they find themselves out of the playoffs just as it gets started. After a grueling 163 games, their season is as over as the Orioles’ season is… but the validity of the Wild Card game is a discussion for another day. Let’s take a look at the best-of-five Division Series. The Astros’ journey to repeat as World Champions makes its first stop against Cleveland. One of the first teams to clinch their spot in the postseason, Houston nearly gave up the division lead before ultimately finishing off the final two weeks with a commanding six-game difference. For the Indians, there was hardly any doubt that they would finish at the top of the AL Central. As weak as every other team in that division was, it’s hard to figure why the Indians have the worst record of all playoff teams besides Atlanta… perhaps we are about to find out. The Astros are the same powerhouse that they were last year, but they are missing one thing: hunger. They have a convincing 103 wins on their resume, but they don’t have the feel of a dominant win-at-all-costs mentality when it counts. A.J. Hinch has proven that he is one of the best managers in the MLB, but he has not instilled the same drive as he did when the Astros claimed their first title in franchise history last year. The talent is there at the plate with perennial superstars Jose Altuve, George Springer, Carlos Correa, and Alex Bregman. Arguably more impressive is their starting pitching staff, as my AL Cy Young winner Justin Verlander takes the hill in Game 1 following one of the best seasons of his long career. His 2017 playoff exploits are well-documented and he should be a force in 2018 as well. The rotation rounds out with aces Gerrit Cole and Dallas Keuchel along with all-star Charlie Morton. They have all the pieces, but do they want it enough? The Indians have been surprisingly lackadaisical in their own right…basically the Patriots of the MLB. There isn’t any reason the Indians shouldn’t have run away with their division, and granted, they did by 13 games, but staying under 100 wins worries me. Preseason, I had the Tribe just behind the Astros for the best record in the MLB, so this match-up is very high-profile, and will be very difficult for the Indians to take on without home field advantage. Cleveland boasts some big bats too. Of course there’s Jose Ramirez, Francisco Lindor, and Edwin Encarnacion, but now there is the controversial addition of former AL MVP Josh Donaldson. For those unfamiliar with the situation, Donaldson was on the DL for the Blue Jays when he was reinstated to the MLB roster before being immediately traded and put back on the DL by the Indians. It’s against MLB trade rules to deal an injured player, so this was met with some ire around the MLB. In any case, the man is here now, and we are yet to see what he truly brings to the table for the Indians. The key for this series is starting pitching. The Astros have the better all-around lineup, and the Indians can control the game beyond the 7th inning. That gives Houston 5 or 6 innings to take a lead and try to hold it. Houston can definitely be confident in their rotation, but Cleveland’s is a question mark. Sure Corey Kluber is one of the best pitchers in the game, but he has yet to play great postseason baseball. Carlos Carrasco is the obvious number two, and he famously missed out on the 2016 World Series run with an injury, so his playoff experience is limited. Beyond that, injuries have left the Indians scrambling for innings, and that will ultimately cost them. This is what baseball is all about. The best rivalry in sports in an abbreviated best-of-five playoff series. It’s hard to believe the last time these two giants met in October was the infamous 2004 ALCS that saw the Red Sox come back from an 0-3 hole to win the pennant. The Sox and the Yankees have had two of the best seasons in the MLB this year, and neither wants to have their work undone by their bitter rival. Let’s get into it. The Red Sox haven’t played a game in five days, and that could be a huge factor in Game 1. Too much rest is definitely a bad thing, especially when they face a Yankees team that has maintained some hot bats as the season came to an end. However, new manager Alex Cora has led Boston to their best regular season in their long franchise history, and there are countless factors to explain it. First, they have a nearly unstoppable lineup. From top to bottom, Boston has a deadly combination of contact, power, and an ability to get the important hit. I could single guys out like my AL MVP Mookie Betts and J.D. Martinez, but truthfully there isn’t a single guy on that roster that I wouldn’t trust with the bat in his hand. The Yankees pitchers will have to do their homework. The likes of Chris Sale, David Price, Rick Porcello, and even Eduardo Rodriguez have been superb throughout the summer, but their postseason track records tell a different story. We already saw one of the greatest pitchers of all time get benched in Game 1 for his lack of postseason success, but by the looks of it, the Red Sox are going to try to power through. 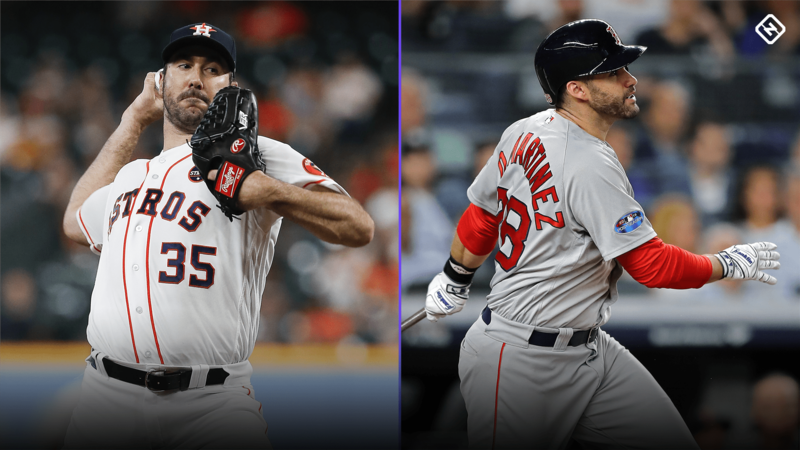 Either these guys find their form in some of the most heated ALDS action in years, or their legacy is already written in stone, and they crumble under the playoff lights. This is great news for the Yankees, as their biggest weakness is easily starting pitching. They’re down an ace after Luis Severino started the Wild Card game and spun a gem through four innings before Aaron Boone quickly pulled him from the game. I initially questioned the move, but it worked out in the end as Dellin Betances eliminated the threat and the Yanks cruised into this matchup. J.A. Happ and Masahiro Tanaka aren’t major steps down, though on paper they are inferior to the Red Sox’s rotation. So, with a small advantage going to Boston’s bats and the pressure on the ace pitchers to play like it in the playoffs, the pressure is on the Red Sox to win. This is sure to be another exciting chapter in this great rivalry, and we are all lucky to see it unfold starting tonight. I’ll be honest, I never really thought I’d be making a playoff prediction between the NL regular-season champion Milwaukee Brewers and the Colorado Rockies. Both of these clubs have had absolute fairy-tale seasons and it’s going to be a shame to watch one of them bow out now. Before going any further, I know Game 1 happened yesterday, but it hasn’t influenced my overall series prediction. An advantage that the Brewers have, unlike the Red Sox, is that they haven’t had to wait quite as long for their next game. However, the Rockies haven’t gotten much time to breathe and take in the moment having to play in some extremely important baseball games over the past week. Well, now Colorado made it. How do they respond? Ironically, it’s been stellar pitching. They are known for the hitter-friendly Coors Field and dangerous bats of Charlie Blackmon, Nolan Arenado, and Trevor Story, but they have failed to truly produce so far this week. Luckily, the Rockies have played great defense and kept their dreams alive by silencing their opponents’ bats as well. I don’t really expect that to continue, as last night was proof that the Rockies will need to string runs together to win ball games at this level. The Brewers lucked out last night as they were virtually shut out but for a Christian Yelich two-run homer to give them some comfort. With a pitching staff like Milwaukee’s, who didn’t even have a true starter for Game 1, it’s probably only a matter of time before the Rockies wake up at the plate. I love the style of the Brew Crew. Yes, Yelich is probably the NL MVP, but even he isn’t truly a “big name”. You have the Bryants, the Altuves, and the Trouts, but the Brewers don’t really have a true star. Across the board they do their job and contribute. Cain, Yelich, Moustakas, Shaw, Aguilar… they do what they’re good at, and they do it well. That wins you an even-matched playoff series. I saw the score for Game 1 here too, but it only reaffirmed my belief that the NL is the Dodgers’ to lose. They have by far the best and most experienced batters, pitchers, and coaches. It really is that simple. The Braves are young and have had a tremendous season out of nowhere, but they have the worst record among playoff teams, and they just aren’t ready for baseball like this. The nothing-to-lose attitude is great, and maybe they can steal a game from L.A. with that mentality, but it isn’t sustainable in a must-win format. I don’t really have much more to say on the matter. The Dodgers held out Kershaw from Game 1 due to his postseason miscues, and they were still all over Atlanta from the first batter… literally. This should be quick and painless for the Dodger faithful, and at least Atlanta can say they made it this far. Congrats to the NL East Division Champions, it was well deserved and it’s only the beginning with guys like Ronald Acuna, Ozzie Albies, and Freddie Freeman sticking around for the long haul. We may have finished the regular season a day later than some anticipated, but we don’t have to wait any longer for postseason baseball. Before I get to my predictions for the midweek games, indulge me as I detail my MLB predictions since creating Sports Thoughts: 6 division winners in 2017 and 3 in 2018 (75%), 7 of 10 playoff teams in both 2017 and 2018 (70%), as well correctly predicting that a Game 163 would occur in 2018. If it wasn’t for the Cubs dropping to the Brewers at home on Monday, I’d be 83% effective when picking division winners, the only misses being a disappointing 2018 Nationals campaign, and a historic Red Sox season that saw them outlast the Yankees for the AL East title. Last year, I also correctly predicted both Wild Card games and both Conference Championships, but my Achilles heel was a 1-3 record in the Division Series, and so I finished with an improvable 56% postseason record. We’ll see if I start just as hot as last season with my picks for Tuesday and Wednesday nights. Let’s take a look at my 2018 Wild Card predictions. Unfortunate scheduling sees the two tiebreaker losers playing the very next night to keep their seasons alive. The Cubs were looking at the #1 seed in the National League 24 hours ago, and now they’re facing elimination. The Rockies made it interesting against the Dodgers late, but still suffered a tough loss. Now they hop on a plane to Chicago with their season on the line. It was an emotionally draining day for both clubs, so who can pick up the pieces first? The pitching matchup features the veteran Jon Lester for the Cubs taking on an upstart young pitcher in Kyle Freeland. I wouldn’t say either can necessarily take over the game, thus I expect the bullpen to make the difference late. Both lineups are pretty much equally dangerous at the plate. The likes of Charlie Blackmon, Nolan Arenado, and Trevor Story get help from a red-hot David Dahl and a steady DJ LeMahieu for the Rockies. The Cubs return all of the crowd favorites to the postseason as Anthony Rizzo, Kris Bryant, Javier Baez, and Ben Zobrist. The X-factor for Chicago is Daniel Murphy, the former Mets second baseman who nearly single-handedly crushed the Cubs’ World Series dreams in 2015. Now, he can change the North Side’s opinion of him if he can deliver for Chicago on Tuesday night. Additionally, with the luxury of staying home for a good night’s sleep on Monday, the Cubs have a huge advantage in not only rest, but a raucous home crowd in the friendly confines of Wrigley Field. Despite struggling in the 8th inning against the Brew Crew, I think the combination of a relentless, experienced lineup and a rested pitching staff gives the Cubs a best-of-five rematch with Milwaukee. The story is far different for the American League Wild Card game. As the seeding was locked in way before Game 162, the A’s and Yanks could afford to go into cruise control as they prepared for their upcoming elimination game on Wednesday night. It’s hard to predict how the players and coaches will deal with the emotions that come with playoff baseball in Yankee Stadium, and without announced starters at the time of this article, it’s even harder to foresee how the early innings will go down. I’ll be blunt: the Athletics’ starting pitching is pretty abysmal. Luckily, they boast one of, if not the best bullpens in the MLB. Mike Fiers is really the only starter that has a shot in this game, and he was just shelled by the Angels in his last start. Meanwhile, word has it that Liam Hendriks, who hasn’t allowed a run since September 1, may throw the first inning or two before turning the game over to the rest of the pen. It would be a smart move to play to their strengths, but that puts a lot of stress on Oakland’s bullpen not only on this game, but down the road if they are fortunate enough to advance. For the Yankees, I’m giving the start to ace Luis Severino over J.A. Happ, who is 7-0 in a Yankee uniform. While Severino hasn’t been the Cy Young candidate fans were expecting, he has a pretty superb 3.39 ERA on the season, and he has held opponents to three runs or less in his last six quality starts. However, it’s worth mentioning that in the middle of that span he had his worst start since July. On September 5, he allowed 6 runs on 6 hits in 2 2/3 innings to.. guess who? The Oakland Athletics. With all of that said, the pitching isn’t the story of this matchup. The A’s and Yankees have two of the best offenses in the MLB and it’s going to be feast or famine at the plate. There really isn’t a single guy I’d want to face on the Yankees roster, as they bring sluggers Aaron Judge, Giancarlo Stanton, Andrew McCutchen, Gary Sanchez, and Luke Voit who is absolutely on fire. If Oakland goes with their bullpen strategy, I expect double-digit strikeouts, but also at least three home runs. The A’s aren’t as dangerous from top to bottom, but they sure can swing it at the heart of the lineup. Khris Davis has crushed 48 home runs while playing games at a very deep Oakland Coliseum, Jed Lowrie has 99 RBIs to trail only Davis’s 123 on the team, and Matt Chapman and Matt Olsen seemingly always come through in the final innings when Oakland needs a rally. In a hitter’s park like Yankee Stadium, it doesn’t matter who is on the mound… the A’s will take them deep. The flow of the game will echo their respective seasons. They feel each other out for innings 1 and 2. The bottom of the Yankees order hits Fiers after he comes in for Hendriks, and the Yankees finish the 3rd up 3-0. Severino gives one or two back, but that’s it through 5. The Yankees go hitless until the 6th when they string a few together to take a commanding 7-2 lead by the 7th inning stretch with a couple of long bombs. However, when the mighty A’s closers come in, they are unable to extend the lead as Oakland starts their comeback. Two runs in the 7th, another in the 8th, and an RBI double with one out in the 9th. Now clinging to a one-run lead, manager Aaron Boone opts to leave in Aroldis Chapman who strikes out the final two batters and strands the tying run in scoring position. I hope this does not become routine, but I’ve got another abridged version of my Sunday picks. Along with some West Coast excitement in the afternoon, fans will be treated to one of the best rivalries in the NFL in primetime. To cap it off, Monday Night Football showcases a young Patrick Mahomes setting records as he continues to prove my early predictions about him wrong. Let’s take a look at who wins these grudge matches in Week 4. This is a critical game for both teams. The Browns have to answer questions about their legitimacy after their first win in 624 days, and the Raiders need to get their first win under new coach Jon Gruden. I would also venture that both teams put out a bigger weakness more so than any strength, so we’ll see the Raiders mediocre defense take on Baker Mayfield in an offense that hasn’t truly gotten off the ground yet. Browns win 28-21. The Cardinals are going to have a tough time winning a game this year. In an 0-3 hole and tons of issues on both sides of the ball, it might be a while until Arizona sees their first W. The Seahawks are definitely not the same as the dominant team we’ve seen in years past though, so this rivalry could be closer than it should be. Seahawks win 24-14. In what I still believe could be a future playoff clash, the Saints and the Giants meet at MetLife Stadium underperforming thus far. Despite a very potent offense paced by the Drew Brees to Michael Thomas connection, the defense continuously surrenders just as many to the opposition. I’d like the Giants to pull it out and stay competitive in the NFC East race, but I think they fall just short today. Saints win 31-23. This one got a whole lot less interesting when Jimmy Garoppolo went down with a torn ACL late in the 49ers’ Week 3 tilt with the Chiefs. The Chargers had a tough schedule to kick off their promising campaign, but there’s nothing like a weak defense and a new opposing quarterback to help them get to .500. Chargers win 31-10. One of the fiercest rivalries in sports today, these arch-rivals clash under the lights of Heinz Field for Sunday Night Football once again. The Steelers look anything but sharp after committing 6 turnovers against the Browns, getting manhandled by the Chiefs, and surviving a comeback from the Buccaneers. The Ravens’ bread and butter has traditionally been a stout defense, but it’s the offense that’s been taking care of business this year as they average over 32 ppg. Ravens win 30-24. I stand by the awful draft pick reaction when the Chiefs traded up to get Patrick Mahomes, but I have to admit he has been a major catalyst for an otherwise talented Chiefs offense. I didn’t believe a rookie unfamiliar with the system could perform the way he has, and for that, I sincerely apologize, Patrick. Chiefs win 28-13.